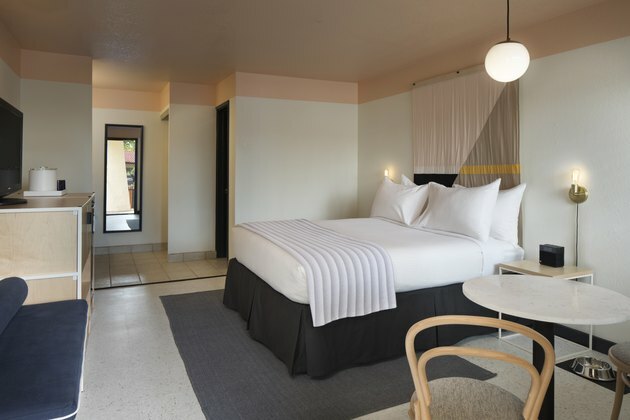 Converting a 1970s-era motel into eclectic accommodations was a dream project for interior design firm Studio Tack, whose other projects include the Brentwood Hotel in Saratoga Springs, New York, and Anvil Hotel in Jackson, Wyoming. 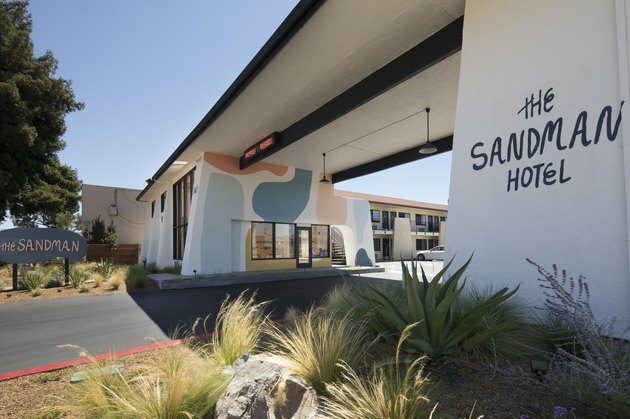 There was "a lighthearted spirit missing from the wine region," says designer Brian Smith about the reasons behind creating The Sandman in Santa Rosa, California, in the heart of Sonoma County. B&Bs and wine-focused resorts have long been the bulk of travelers' options there, with few boutique lodgings. Before the renovation, the rooms were seriously dated. "Some of them had red carpet and blue carpet, typical of 1990s motor lodges," recalls Smith, "and La-Z-Boy-ish sofas plus dark woods." Working with a small budget, a decision was made to leave the bathrooms alone (but add Malin + Goetz's wildly popular toiletries) and instead focus more on making the rooms fun, injecting a "sense of humor" into the design whenever possible, says Smith. Determining what to revamp and what to leave as-is "was an exercise in what's important," he says. 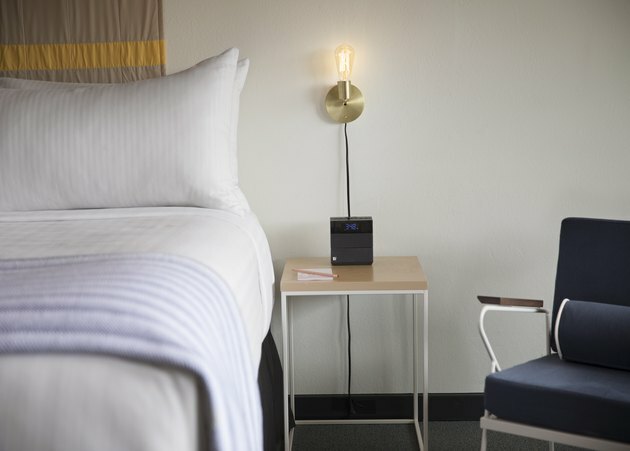 "Hotels are more than just a place to sleep," says Smith. "A motor lodge can be a destination." Built-in benches with cushions by Austin, Texas, design studio Yucca Stuff make a tight lobby feel cozy while large picture windows bring in natural light. Sconces by Rich Brilliant Willing (see example above the largest of the three paintings) were also added to the lobby. Studio Tack partnered with custom furniture maker Christopher Naefke of Alameda, California, to create the reception desk (off to the right in the photo) in the lobby, made from light ash wood with a light matte finish. 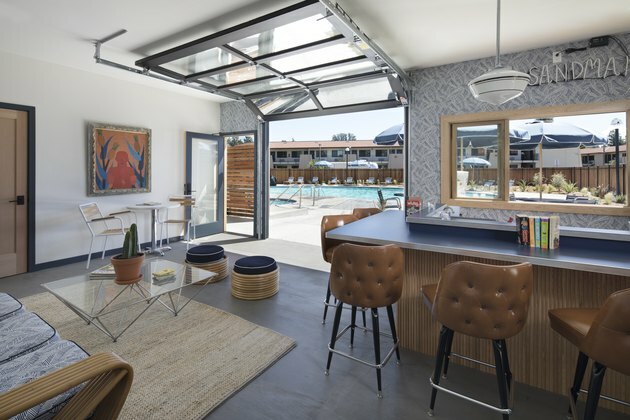 The breakfast room was replaced with this cool bar and hang-out space, which has pool access, thanks to a retractable garage door. The mirrors with hand-painted silk and mohair are the brilliant work of Providence, Rhode Island design duo Ben and Aja Blanc, sold through The Future Perfect. The Lavaca table by Yucca Stuff was created out of limestone and ash. 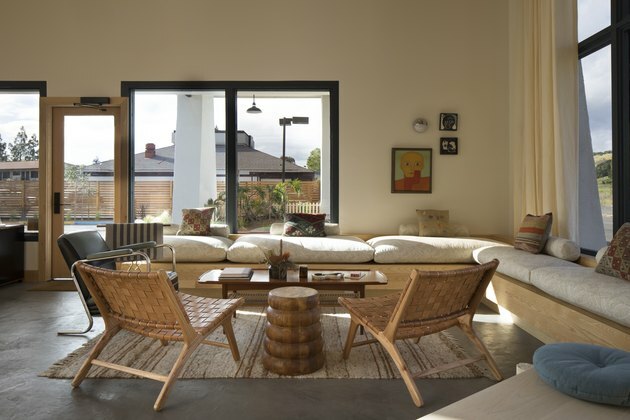 A vintage Paolo Piva chrome and glass coffee table completes the vibe. Retro leather bar stools, fun wallpaper, and a rattan couch channel the cool aspects of midcentury modern furniture design. 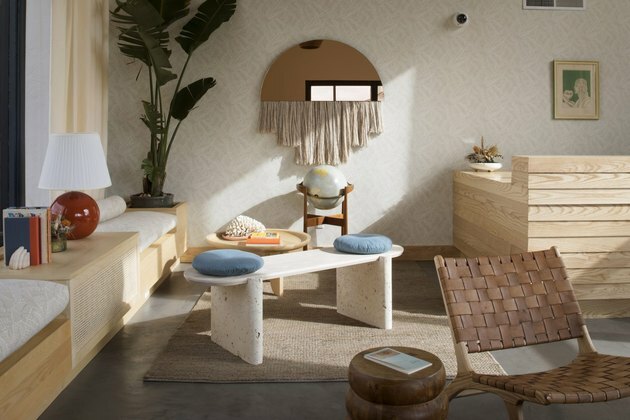 Using similar materials and techniques as the lobby's reception desk, Naefke created storage systems and bedside tables for the room out of light ash wood. Hanging behind each bed are quilts sewn by Minnesota artists, retailed by Louise Gray. Gold sconces next to the bed, with on-trend Edison bulbs, were created by Cedar & Moss near Portland, Oregon.